Melbourne Band 285 – The lead singer brings his own antics and voice to the stage as the amazingly outrageous front man. With the other members as the foundation for this sensational band. Melbourne Band 285 have entertained audiences all over Australia and have performed for both local and international celebrities and dignitaries. 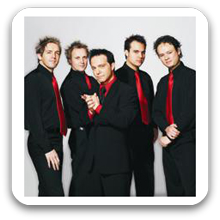 A must for any venue or function, Melbourne Band 285 will make sure your event is a night to remember with “non stop hits” and a party like only Melbourne Band 285 can deliver! Dance the night away and watch this amazing band perform and entertain you with some amazing antics and costumes. From zooming around on mini bikes and scooters to exploding giant balloons, Melbourne Band 285 are a must for all your entertainment needs. Working closely with all event and venue organizers Melbourne Band 285 can play to all audiences and at any festival, function and venue. Melbourne Band 285 are the entertainment answer to your next event! !.